Can Şifr be used on Lotus Field? No. Lotus Field cannot have its strength lowered. What is the strength of Wraparound if there is no fracter installed and the Runner uses Şifr? What if the Runner then installs Paperclip from the heap? Wraparound will be 0 strength until the end of the encounter or until another strength modifier is applied. It will still be 0 after Paperclip is installed, as Wraparound losing the +7 strength modifier is not the same as applying a -7 modifier. The Runner has a Parasite hosting four virus counters and installed on a rezzed Architect, and they have an Atman with no power counters on it. Can the Runner use Şifr to set Architect’s strength to 0 so they can break it with Atman? No. Şifr can only lower the strength of an ice to 0, it cannot raise it. The Corp has a rezzed Sandburg and 14. The Runner has a Faust installed. If the Runner uses Şifr when they encounter Bulwark, what is Bulwark’s final strength? Bulwark’s final strength once the runner has the ability to use paid abilities to break subroutines is 3. When Şifr is used, it is the most recently applied modifier, so even though Sandburg gives Bulwark +2 strength it still has a final strength of 0. Then when Bulwark’s ability resolves causing the Corp to go from 14 to 16, Sandburg’s effect updates and becomes the most recently applied modifier, which applies after Şifr sets the strength from the base of 8 to 0; the final strength becomes 3. Every now and then we get a new card that elicits the usual "The sky is falling!" I remember when Marcus Batty came out, people said "You can't just give Jinteki another 3 copies of Caprice!" Batty never ended up warping the meta and the worry was for naught. This card though... oh boy, this one truly has the potential to change the entire meta game. 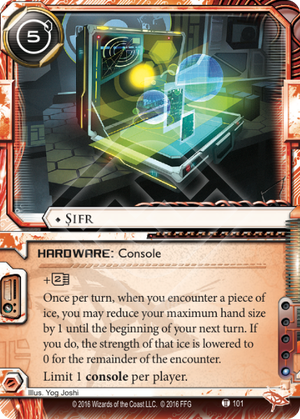 For 5 credits, the runner can invalidate an entire piece of ICE per turn. In that respect, it is the same as Security Nexus. This needs a lot less set up, is only one influence, and is a red card. Red cards are good. Let's remember the way Cutlery Whizzard- or Dumblefork- the most oppressive runner since Pre-Paid Kate plays the game. They would break ICE once, on a face check. Hit a Tollbooth or Archangel, break it once with D4v1d or Faust and then never break it again until it was using Spooned. That deck is still very good, as Faust breaks most things, Mimic/MKUltra breaks the other things, and your resource cost and speed can outpace the corps equivalent costs of rezzing ICE and installing it. This card fits right into that deck as a way to make both the facechecks and subsequent destruction a lot easier. Now, you facecheck, break/bounce at a reduced need for D4 tokens/Faust pitching, and then you can play Parasite next turn, make the ICE zero str with this console, and it's gone. You can recur the Parasites with Déjà Vu, you can Levy AR Lab Access everything back through. 1 influence means you can do the same with Shaper and Clone Chips, using the in faction draw engine of Diesel and Quality Time in place of Wyldside and Adjusted Chronotype. ICE has had a rough time of late. Corp late games are weaker than ever, this is why cards like Caprice Nisei and Ash 2X3ZB9CY were staples in the glacier based game. Rumor Mill made that harder than ever, and this card doesn't help. Even a more "fair" reg-Anarch can use breakers like Yog.0 to pay zero for some of the best ICE we've seen in a while, Fairchild 3.0 and DNA Tracker. So what are the answers? Lotus Field is immune, and also doesn't rotate out of the card pool later this year. However, it is broken for 2 cards with Faust, is expensive to rez, does nothing on facecheck, and gets Spooned easily. I'm not a fan of it. Architect can't be trashed, and is invariably a "must break" for the runner. Magnet is immune to Parasite, but at only 3 str, it is a gear check at best. A good gear check, for sure, but not a long term solution to already amazing runner late game. Lab Dog trashes hardware, Faust/Atman 0 breaks it no problem though, and I would imagine these are the two most common AI breakers you'll see in Sifr decks. Oh and the runner chooses a piece of hardware to trash, so like, it's really bad. Best Defense if you can land 5 tags. Observe and Destroy if they are tagged and poor. I'm not sure about this one really. Trashing a key runner card may buy you some time, but at 1inf and so powerful it will be a 3-of in decks. idk, tbh. I think any corp relying on scoring behind ICE are even more screwed than they were before, and this card needs to be instant ban material if any kind of glacial strategy is to be viable. Get rid of this and Rumor Mill and I honestly think the game will improve ten-fold. The name of the card means "zero" in arabic (and "cipher" in Azerbaijani). It also is, quite possibly, the briefcase Null holds on to, visible on Credit Crash card art. Unsurprisingly enough, it offers a similar, though a lot stronger ability and both seem to go along together nicely - once you trash a card to Null's ID, you won't need an additional card slot in your grip unless you plan to draw back up. I like to think that Şifr has anything to do with Boris "Syfr" Kovac. Like that part in Neuromancer where Case uses Dixie Flatline - a long-dead elite hacker whose memory and personality is stored on a portable disk drive - to crack the ICE guarding the Villa Straylight and ultimately free Wintermute from his prison. Perhaps there is a russian cyborg's spirit inside the briefcase, and his mad haxx0r skills, while unnerving and putting a significant mental strain on the jacked-in runner (resulting in something of a temporary brain damage, because, you know, this guy is really kinda dead and now in your head), lend you a helping hand with the toughest bits of murder code. That's a huge stretch though, and probably completely false - I don't think Syfr was ever a canon character to begin with. Also, remember Null was Weyland's whistleblower, which probably means his suitcase is full of corporate top secret files and accessible backdoors. The temporary grip reduction is probably an effect of having to process a lot of information in a short period just to find a hole suitable for current situation. Believing Şifr actually has any fluff behind it cheers me up a little and helps to forget how terribly imbalanced this card is - and how dreadfully downhill this game goes with each data pack. This card is obviously OP, everyone knows this. I find it almost impossible to not add this into ANY deck. It will be among a large list of Anarch cards currently on the MWL soon enough. Sure, it's absolutely broken with Parasite and the Cutlery Forked, Spooned, Knifed. But.. it's ridiculous with any icebreaker even without doing ice destruction. The ability to effectively disregard the strength of any ice no matter how powerful it is will save you A LOT of credits. It's a good thing this is only 1 influence, otherwise Anarch would just be... mandatory. They pretty much almost are without this card, lol. You can easily use this in Shaper along with Parasite. Clone Chip, Test Run, Scavenge and Self-modifying Code are in faction, so the parasite combo will be very potent in Shaper. What about Criminals? Man.. they just can't catch a break. They just don't have the influence to do effective and constant ice destruction like the other factions, not to mention they have no recursion in faction. Without ice destruction this console is still amazing I feel, but is it better than Desperado, once the best console in the game? No.. not without ice destruction. I feel criminal is in an even worse spot than they were before just because they can't do ice destruction. Worst of all though, is making a corp deck against this. Sure, you can play around it but I'm just not feeling it really. It's exhausting and very frustrating. This card makes me want to quit. It has 100% killed any hope of glacier coming back and is still a massive anti-fun card even if you play around it, and it has made criminal a joke. The more and more data packs they release, the more I can't be bothered really. Give me back the game I once loved. +2 MU seems like the new standard for consoles (Maya, Mirror, The Gauntlet. Allows instant trash of ANY rezzed piece of ICE with Parasite !!! Fortunately it triggers on encounter so you have to run through. But it's still strong. Provides an interesting counter to Sandburg for 1 ICE deep servers. Makes Atman 0 a serious all-rounder. 1 influence is dangerous for the game as it raises the par for consoles a bit too far in my opinion. Nice interaction with Omar Keung (sorry anarchives) and with Null. The latter has a once per turn ability too, so both combined would easily deal with 2 ICE deep servers. The downsize is not that big and can be worked around with Drug Dealer or Sports Hopper - respectively 1 and 0 influence. If it gets popular, then Lotus Field will claim its fame back. Goodbye you garbage card. I'm sure people will still shoehorn this into decks at +3 influence but I'll be happy when you rotate. Sifr, you were close to a deathblow to the game I love. No one will mourn you. Goodbye forever.